Ideally, one should have a great deal of courage and strength, but not boast or make a big show of it. Then, in times of need, one should rise to the occasion and fight bravely for what is right. 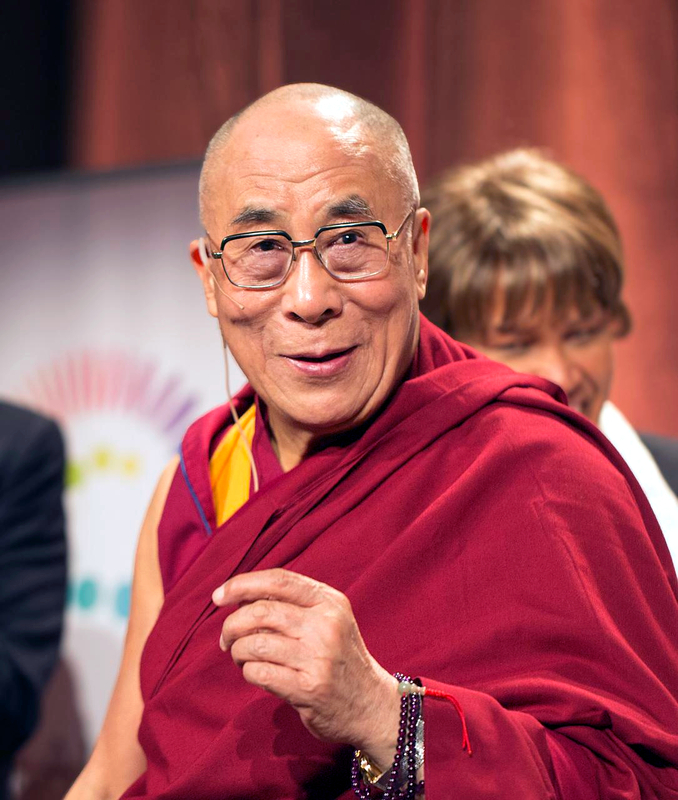 The 14th Dalai Lama (religious name: Tenzin Gyatso, shortened from Jetsun Jamphel Ngawang Lobsang Yeshe Tenzin Gyatso; born Lhamo Thondup; 6 July 1935) is the current Dalai Lama. Dalai Lamas are important monks of the Gelug school, the newest school of Tibetan Buddhism, which was formally headed by the Ganden Tripas. From the time of the 5th Dalai Lama to 1959, the central government of Tibet, the Ganden Phodrang, invested the position of Dalai Lama with temporal duties.The 14th Dalai Lama was born in Taktser, Amdo, Tibet. He was selected as the tulku of the 13th Dalai Lama in 1937 and formally recognized as the 14th Dalai Lama in a public declaration near the town of Bumchen in 1939. His enthronement ceremony as the Dalai Lama was held in Lhasa on 22 February 1940 and he eventually assumed full temporal (political) duties on 17 November 1950, at the age of 15, after the People's Republic of China's incorporation of Tibet. The Gelug school's government administered an area roughly corresponding to the Tibet Autonomous Region, just as the nascent PRC wished to assert control over it. Lack of understanding of the true nature of happiness, it seems to me, is the principal reason why people inflict sufferings on others. They think either that the other's pain may somehow be a cause of happiness for themselves or that their own happiness is more important, regardless of what pain it may cause. But this is shortsighted. No one truly benefits from causing harm to another sentient being. . . . In the long run causing others misery and infringing their rights to peace and happiness result in anxiety, fear, and suspicion within oneself. It is very wrong for people to feel deeply sad when they lose some money, yet when they waste the precious moments of their lives, they do not have the slightest feeling of repentance. In my lifetime, I have lost my country and have been reduced to being totally dependent on the goodwill of others. I have also lost my mother, and most of my tutors and gurus have passed away, although I now have a few new gurus. Of course these are tragic incidents, and I feel sad when I think about them. However, I don't feel overwhelmed by sadness. Old, familiar faces disappear, and new faces appear, but I still maintain my happiness and peace of mind. When, at some point in our lives, we meet a real tragedy — which could happen to any one of us — we can react in two ways. Obviously, we can lose hope, let ourselves slip into discouragement, into alcohol, drugs, and unending sadness. Or else we can wake ourselves up, discover in ourselves an energy that was hidden there, and act with more clarity, more force.